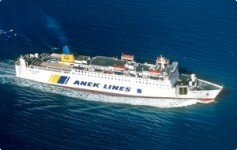 Anek Lines ticket reservations, ferry timetables and passenger information for Anek Lines sailing to and from Greece to Italy, Ancona to Corfu , Kissamos to Antikythira ,Piraeus to Chania and Trieste to Corfu. Booking Anek Lines tickets has never been easier, we compare all Anek Lines prices in real time providing fast quotes so you can buy the cheapest available Anek Lines tickets to and from Greece to Italy, Ancona to Corfu , Kissamos to Antikythira ,Piraeus to Chania and Trieste to Corfu online with instant confirmation. So whether you are looking for a day's shopping ferry trip abroad or a holiday break travelling by Anek Lines is a quick, easy and stress free way to get there and back again. Book you Anek Lines car or passenger ferries tickets with us and enjoy more choice and flexibility. With the latest Anek Lines crossing information and timetables for all ferries sailing to and from Greece to Italy, Ancona to Corfu , Kissamos to Antikythira ,Piraeus to Chania and Trieste to Corfu including information on the ferry ports and useful tourist information about the destinations our detailed route and city maps will help you plot your Anek Lines ferry journey. If are travelling by car, with your family or as a solo foot passenger book a ferry crossing with Anek Lines and arrive at your destination refreshed, relaxed and happy. 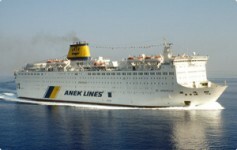 Anek Lines offers fantastic fares to and from Greece to Italy, Ancona to Corfu , Kissamos to Antikythira ,Piraeus to Chania and Trieste to Corfu ferries ports. Book Anek Lines tickets to and from Greece to Italy, Ancona to Corfu, Kissamos to Antikythira, Piraeus to Chania and Trieste to Corfu online in advance at Ferryto.co.uk and you will always enjoy our cheapest available ferry ticket price. The price you see is the price you pay. There are no hidden extras or surprises such as added fuel surcharges or booking fees and we do not charge you anything extra for paying with a Visa Electron card. The price we quote you for your selected Anek Lines route, onboard accommodation and vehicle type is all you will pay, and that's a promise. To obtain a Anek Lines ticket price and book your ferry ticket securely online please use the real time ferries booking form on the left. Every day, all year round, the vessels of ANEK Lines & Affiliated companies (ANEK, DANE, LANE, ANEN) cross the Aegean, Ionian and Adriatic seas, providing a comfortable and safe voyage. During the trip relax in the beautiful, warm surroundings of our spacious inner or outer cabins. All are functional and welcoming, with two, three, or four beds. For the more demanding guests, there are nicely decorated deluxe cabins with a small sitting room, TV, refrigerator, wi-fi Internet and breakfast* at the a la carte restaurant, both services free of charge. Regardless of the category that you will choose, our well-trained staff will be at your disposal to make your trip very special! *This service is available only for Italy-Greece routes. The 36 year old tradition of Anek Lines Ferry sailing the seas of Italy and Greece, has established them as the leader in their field. From the time of their first vessel setting sail up till now, Anek Lines Ferry have been crossing both the Aegean and Adriatic sea with unsurpassed comfort and consistency. ANEK Lines vessel that bares his name is the largest passenger vessel in the Mediterranean. Built at the GDYNIA Shipyards in Poland. It is completely automated, equipped with one of the safest and modern navigational systems with 12 decks. In can transport up to 2,500 passengers and 1,100 vehicles. It has four main engines. The vessel has also been used for it's forever popular cruises in the Mediterranean. This vessel has been named one of the fastest vessel in it's category and is one of the fastest in the Adriatic, as it completes the voyage Greece-Italy (Igoumentitsa - Ancona) in only 15 hours! For this reason it has been christened by the Olympic Gold Medallist Constantinos Kenteris. Built in 2000 at the FOSEN Shipyard in Norway, it is considered a miracle of modern technology for it's automation as well as it's comfort and speed as it can reach speeds of 32 knots. It is equipped with four main engines. Built in 2001 at the FOSEN Shipyard in Norway, it is considered a miracle of modern technology for it's automation as well as it's comfort and speed as it can reach speeds of 32 knots. This vessel has been named one of the fastest vessel in it's category and is one of the fastest in the Adriatic, as it completes the voyage Greece-Italy (Igoumentitsa - Ancona) in only 15 hours! It is equipped with four main engines. Built in 1992 in the SHIMONOSHEKI shipyards in Japan and was completely retrofitted in 2000. It is completely automated with it's sophisticated and safe navigation system. It can transport up to 1,500 and has space for 1,100 vehicles. It is equipped with two main engines. Sophokles Venizelos was the son of the great Greek politician Eleftherios Venizelos. He was born in 1894 and died in 1964. He was repetitively elected as a member of the Greek parliament, served as the Minister of Foreign Affairs, Minister of the Navy, Vice president of the Greek Government, and for a short time Prime Minister. Built in 1990 at SHIMONOSHEKI Shipyards in Japan and completely retrofitted in 1999. Completely automated, it is equipped with one of the most sophisticated and safe navigational system. It can transport up to 1,500 passengers and up to 1,100 vehicles. It is equipped with two main engines. LATO was built in the SETODA shipyards in Japan and was completely retrofitted in 1989. It has two main engines. It is completely automated with the most sophisticated and safe navigation systems. In it's friendly areas which transport 1.800 passengers and 850 vehicles providing all the comforts our passengers have come to expect. They were named after the Island of Crete (KRITI in Greek means Crete). According to the Greek mythology the name KRITI is derived from the name of its inhabitants "KOURITES". These were the first inhabitants of the Island of Crete who lived on the top of mountain Psiloritis. They were agricultural people, sons of mother earth that were born and raised on the earth just like the trees. The KOURITES took over the protection of God Zeus while he was still a baby and was hiding in the cave of Dikteo from his father Kronos who wanted to kill him. In 2007, ANEK acquired the super-luxurious “ELYROS”, which won the 2008 best reconstruction award by the ShipPax Awards. It is the best vessel of ANEK’s fleet. ANEK invested in the most modern, environment friendly materials, which comply with all safety regulations (SOLAS) for domestic and international sea travels. ELYROS offers high quality services to today’s demanding travelers, including the avant-garde Cabin Cinema service. Preveli Monastery was most probably founded during the 16th century. It played a major part during the Cretan Revolutions and especially during the revolution of 1866, when it was the shelter for the revolutionaries and the base of their operations. It was named after the river Preveli which adorns that unique area with the short gorge, the natural protected forest, the waterfalls, the mountains and the picturesque little bay with the palm trees. The Monastery was one of great riches. In 1831, the first Greek School was founded in the Monastery. 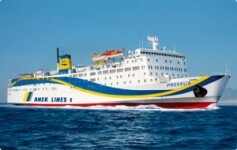 Dedicated to the Monestry vessel "Prevelis" transports with comfort and safety 1,500 passengers and 450 vehicles. Built at the IMABARI Shipyards in Japan and was completely retrofitted in 1995. On June 8, 2011 ANEK Lines and Superfast Ferries create a joint venture in Piraeus-Heraklion and Patra-Igoumenitsa-Ancona routes with two RO-PAX ships in the first one the ANEK owned Olympic Champion and the Superfast owned Superfast XII and three in the second one the ANEK owned Hellenic Spirit and the Superfast owned Superfast VI and Superfast XI. Best Price Guarantee - We always offer you our lowest available Anek Lines ticket price and there are no hidden extras or surprises such as added fuel surcharges or booking fees and we also we do not charge you anything extra for paying for your ferry ticket with a Visa Electron card. The price we quote for your selected Anek Lines car or passenger ferry ticket, onboard accommodation and vehicle type is all you will pay for your ferry ticket, and that's a promise! In the unlikely event you find the same all inclusive Anek Lines ticket cheaper in the brochure of any other tour operator we promise that we will do our best to beat that price or offer you the choice of requesting a refund. To book Anek Lines tickets please click here. Discounted Group Travel with Anek Lines - Ferryto.co.uk offer a dedicated personal and affordable Anek Lines group and coach party ferry passenger reservation service offering you the lowest available ferry rates. Our specialist Anek Lines group travel team will secure the best deal for you and your passengers. The only requirement to qualify for discounted group travel ferry rates is that your party should be at least ten people and travel at the same time. For more information about group travel on Anek Lines please click here. Ferry Logistics offer a personal and affordable Anek Lines freight and cargo ferries reservation service to and from Greece to Italy, Ancona to Corfu , Kissamos to Antikythira ,Piraeus to Chania and Trieste to Corfu. In addition to offering preferential rates to commercial operators and haulers Ferry Logistics is now also able to offer discounted ferry freight rates to private customers such as those wanting to take transit vans on any of the Anek Lines routes serviced. For more information and an instant online quote for your commercial vehicle ferry crossing please click here. At ferryto.co.uk you are able to obtain live Anek Lines ticket prices, check availability, view ferries timetables and book Anek Lines car and passenger ferry tickets at our lowest available ticket price. Ferryto.co.uk is part of the world's largest online ferry ticket distribution network providing the ability to book over 80 major European ferry operators including with Anek Lines to over 1,200 ferry routes throughout the UK, France, Spain, Ireland, Holland, Eastern Europe, the Mediterranean, the Baltic and North Africa. 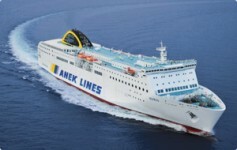 Choose Anek Lines ferries for the cheapest ferry ticket prices to and from Greece to Italy, Ancona to Corfu , Kissamos to Antikythira ,Piraeus to Chania and Trieste to Corfu. We also have ferry offers to more distant ferry destinations and mini cruise destinations like Ireland, Holland, Italy, Spain, Denmark and the Greek islands.